On 27 May 2015, Sangye Tso, a Tibetan mother aged 36, set herself on fire and burned to death in front of the Chinese police headquarters of Chone County, in the Kanlho Tibetan Autonomous Prefecture. It is the second self-immolation protest since the beginning of May, and the 141st since the wave of fiery protests began back in 2009. According to Tibetan leader Lobsang Sangay, Ms Tso is part of a new generation of Tibetans ready to sacrifice their own lives for Tibet’s freedom. A Tibetan woman living in northwestern China’s Gansu province set herself ablaze and died on Wednesday in the second self-immolation protest this month challenging Beijing’s rule in Tibetan areas, sources said. Sangye Tso, aged about 36, staged her protest in the early hours of May 27 outside Chinese police headquarters in Chone (in Chinese, Zhuoni) county in the Kanlho (Gannan) Tibetan Autonomous Prefecture, sources in exile said, citing local contacts. “Chinese police and other officials then came to her house to conduct an investigation,” one source said. Tso, whose charred body was quickly removed from the protest site by authorities, is survived by her husband Tamdrin Wangyal and by a son named Tsering Dondrub and a daughter named Khatso, sources said. 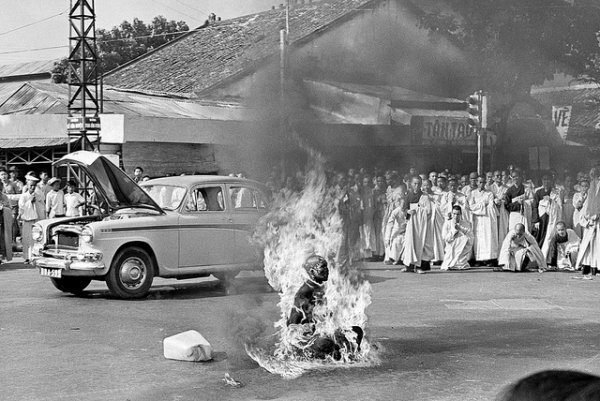 Tso’s burning brings to 141 the number of self-immolation protests in Tibetan areas of China since the wave of fiery protests began in 2009, and was the second to occur this month. On May 20, Tenzin Gyatso, aged 35 and a father of four, set himself on fire and died in the Khangsar township of Tawu (Daofu) county in Sichuan province’s Kardze (Ganzi) Tibetan Autonomous Prefecture, sources said in earlier reports. Local Tibetans believe that Gyatso, who is survived by a wife and four children, had become upset when security forces were sent to Khangsar to prevent celebrations of the 80th birthday of exiled spiritual leader the Dalai Lama, one source said. Speaking on Wednesday at a prayer service held in Dharamsala, India, Tibetan exile political leader Lobsang Sangay described Gyatso and Tso as members of a new generation of Tibetans now sacrificing their lives for Tibet. “Over and over again, they send messages to us in the outside world that the Dalai Lama should return to Tibet and that Tibet should be free,” he said.